Monday January 7, 2019 was our first day of Lame Duck Session. I was extremely excited and also a bit curious to see what the Speaker had in store for us. I got up early to drive to Springfield in order to prepare, because the Speaker has the potential to call any bill that was proposed during the last two years. Speaker Madigan typically keeps the information to himself until the day of Session. I studied hard all morning, reading over potential legislation, and I felt well prepared as we commenced to the floor for the start of the session scheduled to begin at noon. The schedules here in Springfield are a bit of a shock to this farm boy, who is used to eating breakfast at 5 AM every morning and off to make every minute of the day count! I am determined to utilize every part of the day to be productive here in the Legislature. We gaveled into Session around Noon on Monday, and everyone was dismissed to head into their respective Caucus meeting to discuss the upcoming legislation. There were only two bills up for discussion for Monday and Tuesday’s Session. The first one pertained to the Illinois Tollway Authority, which allowed for a change in the appointment schedule for new Board members. 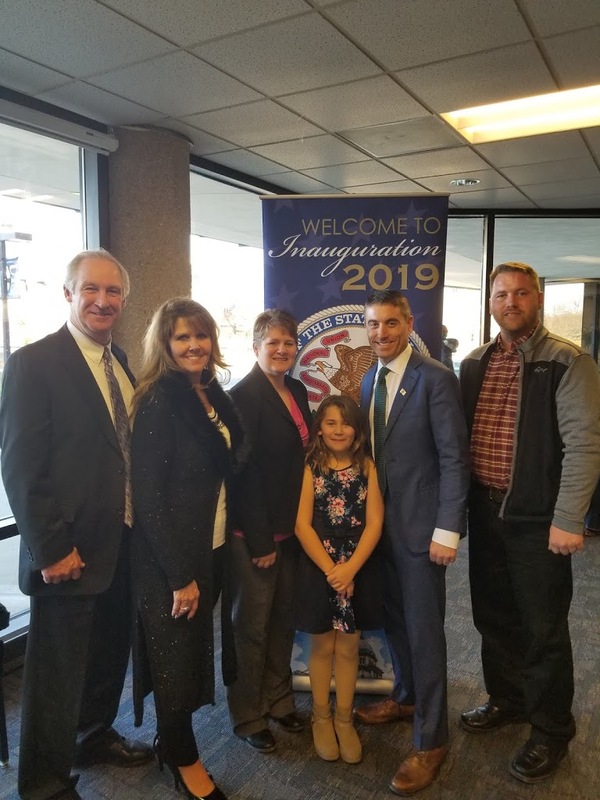 The current board is set to retire in May of 2019, and this piece of legislation would allow the incoming governor the opportunity to start the appointment process this winter. I voted in favor of this legislation to give the new governor the ability to appoint a new Tollway Board. The second bill aimed to authorize a 15 percent pay increase for State Agency Bureaucrats in the administration. After a short caucus, we retired to our offices for the afternoon. The next day, I voted NO on this bill that was ultimately passed by the majority Democrats in both the House and Senate. I came to Springfield to work hard with all of my colleagues across the aisle to clean up this State’s financial challenges. 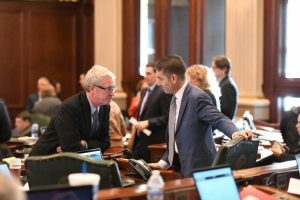 At the request of Governor-elect JB Pritzker, who has not even been inaugurated yet, the General Assembly voted for pay increases for the same bureaucrats that have been a part of the problem in Springfield for decades. They have remained complicit watching the hard working tax payers of the great State of Illinois continue to get the worst deal imaginable year after year. I do believe we need to attract highly qualified candidates into administrative positions, but with the State broke and with likely proposals for new tax increases coming down the pike, it is the wrong time and it sends a bad message. Priority one is to get our fiscal house in order before we spend more money. Leader Durkin and I discussing policy. My time preparing for Veto Session is always time well spent and you can’t go wrong educating yourself, but as I mentioned in my last newsletter the challenge posed by the Speaker’s strategy is figuring out what to prepare for. One small but important goal as I go forward is to be able to better anticipate what may come up and ultimately become more efficient at preparation. I used the balance of the afternoon discussing items with colleagues and calling constituents. I truly believe that this is a team effort and I want the input of the people in the district. The best ideas for fixing problems come from you. Monday, I began a process of calling constituents and asking for their input on what I can do to make things better for the 104th. I am committed to continuing these calls. Hopefully I’ll be talking to you. The week took a positive turn on Wednesday. That day was Inauguration Day. 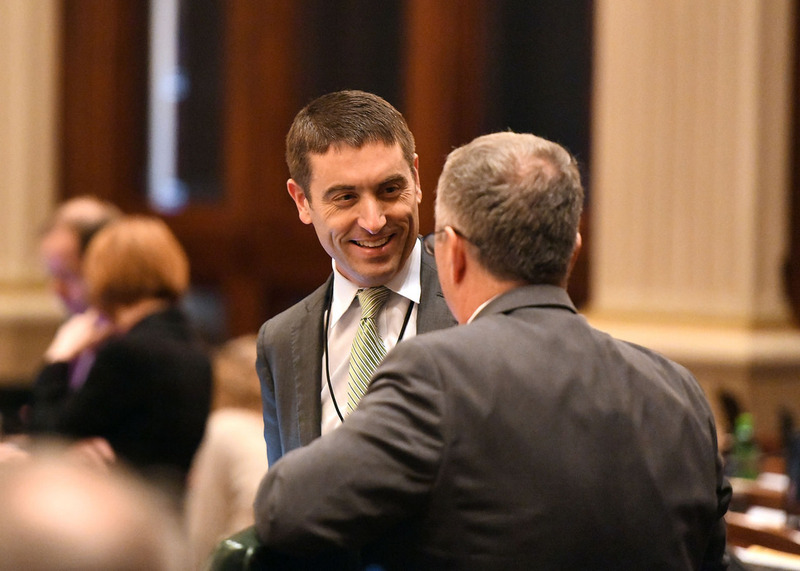 The day contained a series of highs as we celebrated the incoming General Assembly and the hope that we’d be able to work together to forge a better Illinois. The pomp and circumstance of the occasion mixed with friends and family who came to celebrate the special day and made it a memory I’ll not soon forget. Even though I have served since September, on Inauguration Day it hit home about what a truly special honor it is to represent the 104th District! My hope is that the congenial rhetoric of the celebration actually translates into all of us working together for Illinois. Call me the eternal optimist, but despite my reservations from earlier in the week, I believe it can happen. After one more day of session on Thursday to cover parliamentary issues, we headed back to our district offices. I’ve got two big weeks ahead of me, traveling the district, talking to constituents, and gathering more input from you, so that we are primed to make this Session a success. When I’m not busy talking to you, I’ll be reaching out to my fellow House members working on building a bipartisan consensus for the initiatives that we are working on for the 104th. I love this part of the job. There is nothing like learning from listening, whether it’s someone in an important part of the 104th or a legislator from Chicago. I know there will be stressful days ahead, but we are off to a good start and I’m confident we’ll make good things happen.